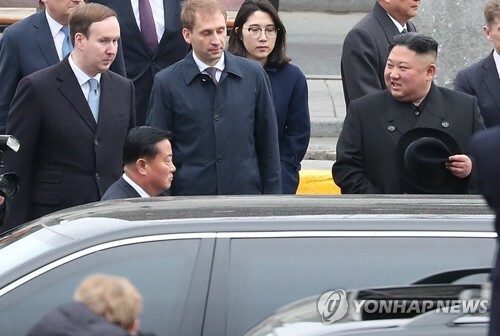 GUNSAN, South Korea, Oct. 11 (Yonhap) -- A Chinese fishing organization in the eastern coastal province of Zhejiang has expressed its thanks to the South Korean Coast Guard for rescuing eight sailors from a fishing boat fire last month in waters off South Korea's west coast, the local Coast Guard unit said Thursday. 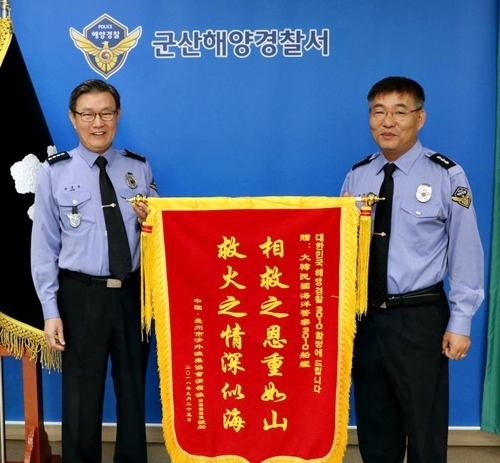 The Coast Guard in the city of Gunsan, North Jeolla Province, said the fishing industry association in the Chinese city of Taizhou delivered a banner of golden brocade and a letter of commendation to Park Jong-mook, chief of the local unit, the previous day. The banner of golden brocade is embroidered with Chinese characters that read, "The benefits of rescue are as heavy as a mountain and the sympathy of rescue from a fire is as deep as the sea." A South Korean patrol ship received a distress signal from a Chinese fishing boat that caught fire in waters 137 kilometers off Eocheong Island in the southwestern coastal city around 2:45 a.m. on Sept. 19. The 3,000-ton patrol ship arrived at the scene in 10 minutes and rescued all eight crew members of the Chinese vessel. In the rescue operation, which lasted about 2 minutes, the rescued crew was transported to the patrol ship as the 159-ton fishing boat burned down.